1946 - Georges Doriot, professor of industrial administration at Harvard Business School, incorporated American Research and Development Corporation (ARDC) in Boston in belief that research and development, coupled with professional management, could generate economic growth, capital appreciation; first independent venture capital organization (closed-end New York Stock Exchange-listed investment fund); only non-family venture capital firm (raised capital from from institutional investors, the public); February 10, 1947 - raised $3,581,750 from investment trusts, life insurance firms, university endowments; first five years - 66% of investments in chemicals, industrial equipment; 1957 - $70,000 investment in Digital Equipment Corporation (gain of $355 million in 1971) ignited Route 128 minicomputer boom, resulted in formation of world’s largest cluster of minicomputer firms; 1973 - acquired by Textron; decline stemmed from organizational design flaws vs. SBICs, Venture Capital Limited Partnerships); no longer significant to development of venture capital industry. 1961 - Arthur Rock (former investment banker at Hayden, Stone & Co. (arranged financing for Fairchild Semiconductor in 1957), Thomas J. Davis, Jr. (former VP of Kern County Land Company responsible for investing land trust's royalties) formed Davis & Rock in San Francisco, CA as partnership (not SBIC or publicly-held); raised $5 million (capital gains split 80/20 between limited partners/general partners); 1968 - partnership dissolved (generated $90 million in capital gains, 54% compound growth rate; Teledyne, Scientific Data Systems biggest hits); first venture capitalist on the West Coast; July 16, 1968 - launched Intel with Bob Noyce (group vice president of Fairchild Semiconductor), Gordon Moore (head of Fairchild Semiconductor's R&D division). 1972 - Eugene Kleiner (scientist - he and seven other scientists from the East Coast recruited by Nobel Prize winner, William Shockley, in 1956 to help build computer transistors; co-founder of Fairchild Semiconductor), Tom Perkins (one of leaders of Hewlett-Packard's early computer hardware division), Frank J. Caufield, Brook Byers established Kleiner Perkins Caufield & Byers at 3000 Sand Hill Road in Menlo Park; leader in providing venture, relationship capital SM services; has backed entrepreneurs in over 500 ventures; more than 150 of firm's portfolio companies have gone public; many other ventures have merged or been acquired. 2006 - Cambridge University comparison study found research spending per start-up was $118 million in US vs. $35 million in UK. 2007 - Venture capitalists invested $29.4 billion into U. S.-based companies, most since 2001: biotech/medical device companies ($9.4 billion, up from $7.6 billion in 2006); financial/clean technology companies ($2.2 billion vs. 1.5 billion in 2006). (American Research and Development Corporation), Ed. Udayan Gupta (2004). The First Venture Capitalist: Georges Doriot on Leadership, Capital, & Business Organization. (Calgary, AB: Gondolier, 240 p.). Doriot, Georges; venture capital. (American Research and Development Corporation), Spencer E. Ante (2008). Creative Capital: Georges Doriot and the Birth of Venture Capital. (Boston, MA: Harvard Business Press, 299 p.). Doriot, Georges F. (Georges Frederic), 1899-1987; Capitalists and financiers -- Biography; Venture capital -- History. Enigmatic, quirky man who created venture capital industry; pivotal events in Doriot's life, business philosophy, stewardship in startups. (3i), Richard Coopey & Donald Clarke (1995). 3i: Fifty Years Investing in Industry. (New York, NY: Oxford University Press, 459 p.). 3i (Firm)--History; Capital investments--Great Britain--History--20th century; Corporations--Great Britain--Finance--History--20th century; Great Britain--Economic policy--1945-1964; Great Britain--Economic policy--1964-1979; Great Britain--Economic policy--1979-1997. (Angel Investors LP), Gary Rivlin (2001). The Godfather of Silicon Valley: Ron Conway and the Fall of the Dot-Coms. (New York, NY: At Random.com, 103 p.). Conway, Ron; Electronic commerce--United States; Capitalists and financiers--United States. (Benchmark Capital), Randall E. Stross (2000). Eboys: The True Story of Six Tall Men Who Backed Ebay, Webvan and Other Billion-Dollar Start-Ups. (New York, NY: Crown, 325 p.). Professor of Business (San Jose State University). Benchmark Capital (Firm)--History; Investment bankers--United States--Biography; Electronic commerce--United States--Finance--Case studies; Venture capital--United States--Case studies; New business enterprises--California--Santa Clara County--Finance--Case studies; Entrepreneurship--California--Santa Clara County--Case studies. (Flybridge Capital), Jeffrey Bussgang (2010). Mastering the VC Game: A Venture Capital Insider Reveals How to Get from Start-up to IPO on Your Terms. (New York, NY: Portfolio, 246 p.). General Partner at Flybridge Capital Partners. 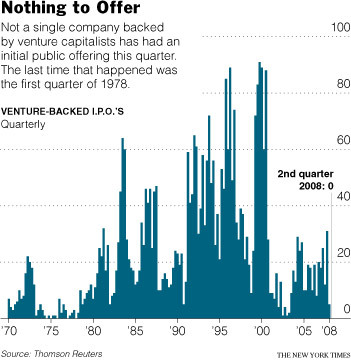 Venture capital; New business enterprises -- Finance; Going public (Securities). Helped build two successful start-ups (one went public, other was acquired); helping entrepreneurs to bring dreams to fruition; insights, stories, practical advice (Twitter's Jack Dorsey, LinkedIn's Reid Hoffman); how to get noticed, perfect a pitch, negotiate a partnership that works for everyone. (Institutional Venture Partners), Ruthann Quindlen (2000). Confessions of a Venture Capitalist: Inside the High-Stakes World of Start-up Financing. (New York, NY: Warner Books, 218 p.). Venture capital--United States. (Kleiner Perkins), Tom Perkins (2007). Valley Boy: The Education of Tom Perkins. (New York, NY: Gotham, 304 p.). Partner, Kleiner, Perkins Caulfield & Byers. Perkins, Thomas J.; Hewlett-Packard Company--Management; Executives--United States--Biography; Novelists, American--20th century--Biography. Adventure and high finance: deals, venture capital, entrepreneurs, ocean racing, vintage cars, women. Hewlett-Packard (administrative head of research laboratories, first general manager of computer businesses) to laser technology, Chairman of Genentech for 14 years, founded Silicon Valley venture-capitalist firm Kleiner Perkins Caufield & Byers; 2006 - resigned from Hewlett-Packard’s board. (Sutter Hill Ventures), William H. Draper, III; foreword by Eric Schmidt (2011). The Startup Game: Inside the Partnership Between Venture Capitalists and Entrepreneurs. (New York, NY: Palgrave Macmillan 272 p.). Founder of Sutter Hill Ventures, General Partner of Draper Richards L.P., Draper Investment Company, and Draper International. Draper, William H., 1928-; Capitalists and financiers --United States --Biography; Venture capital; Entrepreneurship; New business enterprises --Finance. How relationship between venture capitalists, entrepreneurs is critical to future of business: how to evaluate innovative ideas, entrepreneurs behind those ideas (Yahoo, Baidu, Tesla Motors, Activision, Measurex, more); value of political leadership in creating opportunity (how Deng Xiaoping brought China roaring into modern world. (TA Associates), Peter A. Brooke; Daniel Penrice, contrib. (2009). A Vision for Venture Capital: Realizing the Promise of Global Venture Capital and Private Equity. (Boston, MA: Winthrop Group distributed by University Press of New England, 320 p.). Venture capital. Career on frontiers of international finance during past half-century. Peter Brooke has been called "the Johnny Appleseed of venture capital" for his role in the industry's spectacular growth-- from a small base in the Northeastern United States in the 1960s, to today's highly visible role in economies all over world; key to Brooke's success- - vision for industry as essential element of economic growth and development; why industry exists, how it can fulfill its potential in 21st century. (Wolff New Media), Michael Wolff (1998). Burn Rate: How I Survived the Gold Rush Years on the Internet. (New York, NY: Simon & Schuster, 268 p.). Creator of NetGuide. Internet consultants; Success in business; Corporate profits; Internet industry. William D. Bygrave and Jeffry A. Timmons (1992). Venture Capital at the Crossroads. (Boston, MA: Harvard Business School Press, 356 p.). Venture Capital. Karl Capita (2005). Adventure Capital: A Cautionary Tale of the Venture Capital Circus and the Clowns That Run It. (Omaha, NE: iUniverse, 150 p.). Venture capital; Entrepreneurship--California--Santa Clara County--Case studies. Patrick Coveney, Karl Moore (1998). Business Angels: Securing Start up Finance. (New York, NY: Wiley, 233 p.). Angels (Investors)--Great Britain; New business enterprises--Great Britain--Finance; Venture capital--Great Britain. Thomas M. Doerflinger, Jack L. Rivkin (1987). Risk and Reward: Venture Capital and the Making of America's Great Industries. (New York, NY: Random House, 320 p.). Venture capital--United States--History; Capitalists and financiers--United States--History; Industries--United States--History. Paul A. Gompers and Josh Lerner (2001). The Money of Invention: How Venture Capital Creates New Wealth. (Boston, MA: Harvard Business School Press, 282 p.). Venture capital--United States; New business enterprises--United States--Finance. Ed. Udayan Gupta (2000). Done Deals: Venture Capitalists Tell Their Stories. (Boston, MA: Harvard Business School Press. Venture capital--Case studies; Businessmen--Case studies. Steve Harmon; with a foreword by John Doerr (1999). Zero Gravity: Riding Venture Capital from High-Tech Start-up to Breakout IPO. (Princeton, NJ: Bloomberg Press, 267 p.). Venture capital; Going public (Securities); New business enterprises--Finance; Internet industry--Finance. George Kozmetsky, Michael D. Gill, Jr., Raymond W. Smilor (1985). Financing and Managing Fast-Growth Companies: The Venture Capital Process. (Lexington, MA: Lexington Books, 144 p.). Venture capital--United States; Venture capital. Andrew Metrick (9/2006). Venture Capital and the Finance of Innovation. (Hoboken, NJ: Wiley, 592 p.). Associate Professor of Finance at the Wharton School (University of Pennsylvania). Venture capital; Technological innovations--Finance. Essentials of finance can make difference between investing with discipline or with blind hope. Robert C. Perez (1986). Inside Venture Capital : Past, Present, and Future. (New York, NY: Praeger, 189 p.). Venture Capital-U.S.
Scott A. Shane (2009). Fool’s Gold? : The Truth Behind Angel Investing in America. (New York, NY: Oxford University Press, 276 p.). North Coast Angel Fund, Professor of Entrepreneurship (Case Western Reserve University). Venture capital --United States; Small business --United States --Finance; Investments --United States. Group portrait of lionized angel investors; fewer, contribute less, involve themselves in fewer start-ups, typically still have day jobs, make investments of $10,000 or less, take little or no role in assisting entrepreneurs to build companies; recommendations to entrepreneurs, angels for most productive use of angel investing; angel groups. Karen Southwick (2001). The Kingmakers: Venture Capital and the Money Behind the Net. (New York, NY: Wiley. Venture capital; New business enterprises--Great Britain--Finance; Internet industry--Finance. John W. Wilson (1985). The New Venturers: Inside the High-Stakes World of Venture Capital. (Reading, MA: Addison-Wesley, 237 p.). Venture capital--United States. Jeffrey Zygmont (2001). The VC Way: Investment Secrets from the Wizards of Venture Capital. (Cambridge, MA: Perseus, 224 p.). Venture capital; Capital investments; Investments. Directory tracking "new web technology companies at the beginning stages of their growth." It collects "facts and figures about new web products, startup companies, key startup employees, and the funding dollars powering their growth." Profiles include background and rankings (explained in "Startup Search Score" in the About section). Searchable, or browse companies, products, people, investors, or partners. From a Web search and syndication consultant. Online community of entrepreneurs to research, rate, and review funding sources worldwide. In addition, TheFunded.com allows entrepreneurs to view and share term sheets, to assist one other finding good investors, and to discuss the many facets of operating a business.